Thanks for the guest post to Nancy Bilyeau, the author of The Crown and The Chalice, thrillers set in Tudor England. The main character is Joanna Stafford, a Dominican novice. On this date in 1541, 68-year-old Margaret Pole, countess of Salisbury, was beheaded within the confines of the Tower of London, as befitted her rank. She was cousin to Henry VIII’s mother, and well trusted by the king for years. Yet this intelligent and dignified aristocrat died without trial in a horribly botched execution that is considered a low point of Henry’s reign. Margaret knew better than most how difficult it was to survive royal storms if your family was close to the throne. Yet despite all her efforts to stay out of danger, it was her family that doomed her to the axe in the end. George Plantagenet, Duke of Clarence and brother to Edward IV, was her father and Isabel Neville, oldest daughter of the “Kingmaker,” Earl of Warwick, her mother. This glittering pair didn’t last long. Mother died of disease (some whispered poison); the duke, disloyal to his brother the king, was drowned in a barrel of Malmsey in the Tower of London. Second Murderer. O excellent devise! make a sop of him. -Shakespeare’s Richard III, Act 3, Scene 4. Margaret Pole is an ensemble character with no lines in this play. Once the Tudors were in charge, royal children were either imprisoned, such as Margaret’s brother, who spent the rest of his life in the Tower of London,* or assimilated. 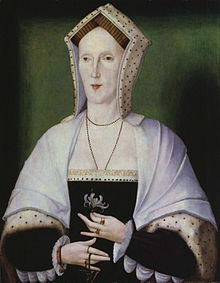 At the age of 14, Margaret was married to Sir Richard Pole, a trusted relation of Henry VII‘s. The marriage was not unhappy, and they had four sons and one daughter. When Catherine of Aragon arrived in England to marry Prince Arthur, Margaret became one of her ladies and a deep friendship sprang up. Years later, when Margaret was a relatively young widow, tall and red-haired, and Catherine was married to Arthur’s brother, Henry VIII, Margaret was singled out for several great honors. In 1512, the king gave Margaret many of the lands of her Warwick grandfather and a family title. She became the countess of Salisbury in her own right. Margaret was selected by king and queen to be the governor for the 9-year-old Princess Mary, their only child. In a separate, vast household, she would be the one to guide Mary toward her destiny as heir to the throne. Some of Margaret’s own children made excellent marriages, such as her daughter Ursula to the oldest son of the duke of Buckingham. Her son, Reginald, began to shine as a cleric and intellectual; Henry VIII paid for his studies at the University of Padua. Margaret did and said nothing else that was publicly critical of the king. She never saw Catherine of Aragon again and rarely saw Mary, to whom she had been a second mother. She spent her time in country retirement. She adhered to traditional Catholic doctrine, and priests lived in her homes. This was not illegal, but as religious reform gained steam, it brought her under scrutiny. However, from the safety of France and Italy, her son, Reginald, chose to make public remarks sharply critical of Henry VIII. He published a treatise in 1536 attacking the king’s claim to superiority over the English church and calling on the princes of Europe to depose him. The king was enraged. Margaret and her oldest son, Henry Pole, Lord Montagu, wrote Reginald letters pleading with him to cease his attacks. “Do your duty or you will be my undoing,” she warned — correctly. In 1538 another of Margaret’s sons, Geoffrey, was questioned and then confined in the Tower of London. He eventually gave statements that his brother, Montagu, and their relations and friends sympathized with Reginald Pole and had privately criticized Henry VIII. Under law, this was treason, punishable by death. All the noblemen accused of being part of the “Exeter Conspiracy” were executed. But there was no proof that Margaret Pole ever wrote or said anything that fell under the definition of treason. It didn’t matter. She was questioned, held under house arrest, and then imprisoned in the Tower of London for two years. She suffered in the winters, and Henry VIII’s fifth wife, the teenage Catherine Howard, bravely sent her some warm clothes. A minor rebellion broke out in England, led by a Neville, her mother’s family, but unconnected to Margaret. Nonetheless, it seems to have prompted Henry VIII to eliminate the woman whom he had once trusted and admired, who was his closest female relative after his daughters. Early in the morning of May 27, the Constable of the Tower woke up Margaret to tell her she would die within the next few hours. The ailing countess replied she had never been charged with any crime. Because of her royal descent, she was executed on the Tower grounds, on the same spot as Anne Boleyn five years earlier, before more than 100 spectators. There was not enough time to erect a scaffold; also, the executioner was not in residence, only his novice. Margaret commended her soul to God and asked the spectators to pray for the king and queen, Prince Edward and of course the Princess Mary. Reports conflict on what happened next. Some say she refused to kneel before the block on the ground, or to stand still. The novice swung at her with his ax, hacking at her shoulders, before managing to kill her. It may have taken 10 chops. * The rest of Edward Plantagenet’s life ended at the block in 1499, after he tried to escape with Perkin Warbeck.